Few filmmakers examining their family history in a documentary would find themselves in the thick of the Academy Awards race. When your grandparents are Julius and Ethel Rosenberg, though, the subject resonates far outside the immediate family. Ivy Meeropol's "Heir to an Execution" chronicles her effort to come to terms with the lives and deaths of her father's parents, executed as traitors in 1953 after being accused of relaying the secret of the atomic bomb to the Soviets. "I grew up with this. It was always there and I knew about it because it was just part of our lives. But I didn't really feel the need to delve into it before," Meeropol, 35, said in an interview at the Sundance Film Festival, where "Heir to an Execution" is among 16 films competing for the top documentary honor. The film also is one of 12 up for Oscar consideration in next Tuesday's nominations. "Then I started to be curious about people who knew my grandparents, and family members, too, that I had never talked to. On the personal side, I wanted to know more about what happened, and I wanted to bring people along on that journey." The film weaves archival footage, family home movies and Meeropol's conversations with her father, Michael Meeropol, his younger brother, Robert, other relatives and associates of the Rosenbergs. A deeply personal, occasionally heartbreaking affair, "Heir to an Execution" paints a rich portrait of a devoted couple whose names came to symbolize Cold War hysteria. While the film humanizes the Rosenbergs, it does not lionize them. The Meeropols are convinced Julius and Ethel Rosenberg were railroaded, yet the film makes clear that the family believes Julius may have been a spy and that Ethel likely would have been aware of her husband's activities. In the 1970s, her father and uncle crusaded to reopen the case, convinced their parents were entirely innocent, and Ivy Meeropol grew up with the same conviction. But government documents released in the mid-1990s caused the family to reevaluate whether Julius Rosenberg might have been trading secrets to the Soviets. "I (agree) with the film," said Michael Meeropol, who came to Sundance for his daughter's premiere. "I think the film has done a really good job of identifying the legitimacy of accepting ambiguity and uncertainty. "I'm willing to live with that," said Meeropol, 60, who was 10 when his parents went to the electric chair at Sing Sing. "I can make a fairly good case that the government's documents are disinformation and therefore should be disregarded, or I can make a fairly good case that it's legitimate, and my father is the person in those documents." The documentary captures heart-wrenching moments for the Meeropols, including Michael and Robert's return to the family apartment where they had lived until their parents' arrest. Ivy Meeropol visits the Rosenbergs' graves and has a tearful reunion with a distant cousin after other members of the long-divided Rosenberg family refused to meet with her. Archival footage includes compassionate statements from Anne and Abel Meeropol, supporters of the Rosenbergs who stepped forward to adopt the two boys after the executions. The camera also documents Ivy Meeropol's visit to the modest home of Ethel Rosenberg's brother, David Greenglass, who worked at the atom-bomb test site and testified against the Rosenbergs, but admitted two years ago that he lied about some of his testimony. Ivy Meeropol decided against knocking on the door and confronting Greenglass. Just seeing his house satisfied her curiosity, and she did not want audiences sympathizing with Greenglass as an old man being pursued by a camera crew. "I'm being very honest in the film," Ivy Meeropol said. "I just let go of him as the main villain." The film documents the Rosenbergs' final hours, as demonstrators for and against the executions hit the streets, reporters mobbed Sing Sing and President Eisenhower refused to commute the sentences. 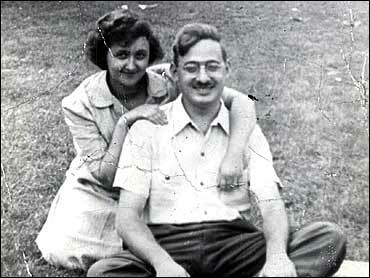 On June 19, 1953, Julius Rosenberg was electrocuted, and Ethel followed him minutes later. To the end, authorities offered Ethel Rosenberg an out, telling her she could avoid the electric chair by confessing. People have often wondered why she did not do it for the sake of her sons, Michael Meeropol said. "At the last minute, our father's already dead, and what she would have had to do is make up stuff," he said. "She would have had to say, `Yes, my husband was a spy,' and then she would have had to lie and say, `I was, too.' So now she goes to jail for 30 years. Does she really take care of us that way? Does that really help take care of us? "Her response was to stand by him and stand by that incredible commitment. And that way, as Ivy says in the film, we get to grow up respecting and loving them."